The changes are expected to run through at least June of 2019. Board Chairman Jack Evans worries that despite "modest" fare increases, added service cuts could worsen already-declining ridership. 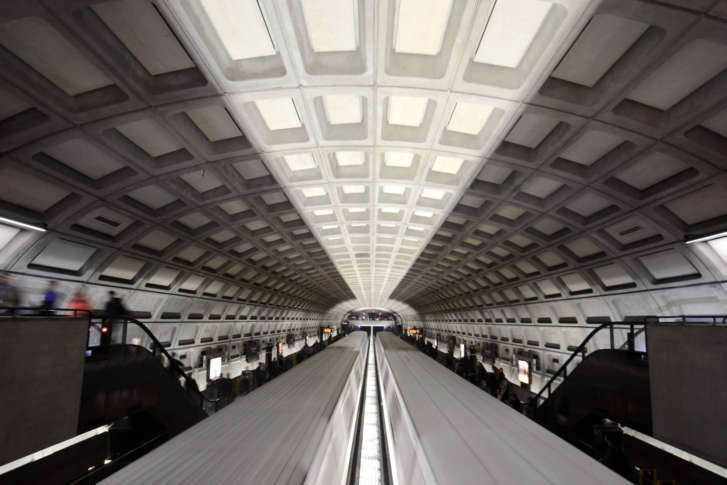 WASHINGTON — The Metrorail system’s hours will change beginning June 25, after the Metro Board gave formal approval on Thursday. Metro staff had already announced the June 25 date publicly, because managers believe switching a week before the agency’s fiscal year begins would make it simpler to change workers’ schedules and because it might reduce rider confusion around the July 4 holiday. Beginning Sunday, June 25, the rail system will be open 5 a.m.—11:30 p.m. Monday through Thursday; 5 a.m.—1 a.m. Friday; 7 a.m.—1 a.m. Saturday; and 8 a.m.—11 p.m. Sunday. The last trains of the night leave the ends of the lines up to 50 minutes before the system’s official closing time. The Metro Board approved the changes Thursday through at least the end of June 2019. Old hours for train service — including 3 a.m. closings late Friday and Saturday nights and a 7 a.m.—midnight schedule on Sundays — could theoretically return then. Since June 2016, Metro has closed at midnight every day of the week with the promise that the additional time has been used for maintenance. As the new service hour cuts begin, Metro is also raising fares and cutting scheduled bus and rush-hour rail service. “All the difficult decisions that the board made will be going into effect. It’s unfortunate. I personally don’t necessarily agree with them, but … this is where we are,” Metro Board Chair and D.C. Council member Jack Evans said. “It certainly won’t bring riders back. The fare increases are so modest, I’m not sure that that’s going to have an effect on ridership,” Evans said. “I think what worries me is taking away some of the service — the bus service. That is really going to inconvenience people, but the hope is that we don’t lose riders, but I’m not sure that that is a possibility. “I think there’s probably a good chance we will lose some riders because of this,” he said. While rush-hour rail fares rise a dime, off-peak rail fares and all regular and express bus fares rise a quarter, which is a much-more-significant percentage increase. This is the first fare increase in three years. Metro’s already-declining ridership is one contributor to the financial situation that drove the service cuts and fare hikes. The need for long-deferred maintenance is another driver for the cuts to service hours. Metro has promised to use the extra time for preventive maintenance work and testing, which agency leaders believe can help cut down on the number of unplanned delays due to track problems. Evans promised Metro would not raise fares or significantly cut service again next summer, but said that will only be possible if the region makes progress on some kind of additional dedicated funding for Metro. General Manager Paul Wiedefeld has said the money is needed by January 2019. Some regional leaders, especially in Virginia, have been skeptical of some of the initial ideas for a dedicated tax. “We’re going to need additional funding. … That’s what it comes back to,” Evans said.